You voted, we listened…Freddy Villalobos is your all time Victoria Generals Second Baseman. As a sophomore at Weathorford College, Freddy joined the Generals in 2011. 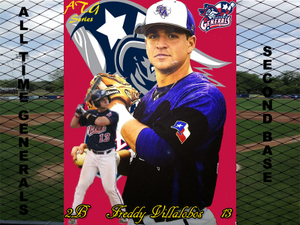 Freddy would go onto play one season with the Generals and earn a spot in the TCL All-Star Game. He led the team with six homeruns and finished the 2011 season with a .279 Batting Average, bringing in 40 RBI’s on 61 hits. Freddy had the work ethic and competitive spirit that would get under the skin of the opposing teams. His passion and knowledge of the game would make him a fan favorite in Victoria. Freddy would transfer to Stephen F. Austin, after the Generals season came to an end. He finished his college career in 2013 with a .294 BA, 122 H, 8 HR, and 54 RBI’s. He still resides in Nacogdoches and works for Scientific Drilling International.